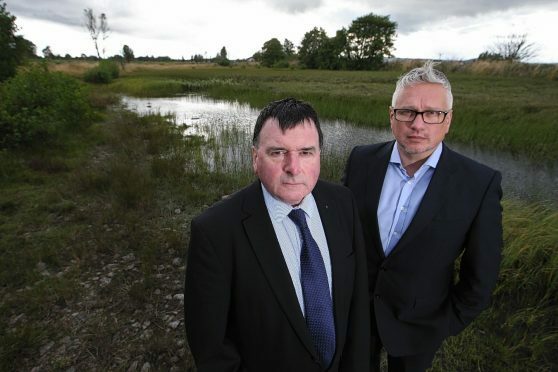 Councillor Ken Gowans and local resident George Moodie at an area of green belt land near Milton of Leys, which housing developer Tulloch Homes wants to build on. A developer’s revised plans for a 100-home estate in an Inverness suburb could drive a road through precious greenbelt. Nearby residents are furious with Tulloch’s plans for a 25-acre site at “Bogbain West” at Milton of Leys on the south side of the city. Having recently fought a proposal to build a jail on its doorstep, the community’s anger is now focussed on an access road to the planned homes. Fresh plans indicate a road being built through an popular area which features a pond, and is close to woodland. The revised document increases the number of homes from 75 to 100. Critics claim it breaches the Inner Moray Firth Local Development Plan. Local SNP councillor Ken Gowans described the proposal as “outrageous”. He said: “I am quite shocked. Instead of leaving a gap between the houses and the pond they’re now proposing a road between the homes and the pond, eating into some of the green strip. “They’ve annexed the pond. If you want to get to it, you’re going to have to cross a road. This is not within the spirit of the Inner Moray Firth plan, which is to leave a buffer zone. George Moodie, who lives in nearby Redwood Avenue, objects to the proposed access road, which would be routed to the north of the existing pond, despite the council and a government reporter having made it clear that the development should be set back from existing homes. “There is also an increased flood risk caused by the loss of natural drainage,” he said. He also warned that local school rolls were already at capacity. Tulloch Homes insisted that its application was “fully compliant” with the local plan. A spokesman said: “We’ve discussed our proposal in depth with all the relevant authorities. It was first announced in June and the subject of public consultation meetings then, which produced an overwhelmingly positive response. “What will be created includes new shopping units, much needed affordable housing plus homes for business use and the provision of land for a nursery at Milton of Leys Primary School.